Sun: Sun helps to improve health. Bones, eyes and heart diseases occurs due to Sun. To strengthen and to get benefits from Sun take bath in front of rising Sun. It is also beneficial to keep saffron, red flower or red sandalwood in bathing water. Moon: Moon directly relates with mind. Mental disorders, depression, insomnia, cold-cough occurs due to Moon. To strengthen Moon takes bath feeling water in shell. You can also put fragrance flower or white sandalwood in bathing water. Mars: Mars directly relates with blood and courage. Threat, blood, fever and injury problem occurs due to Mars. To strengthen Mars keep peel of bel, red sandalwood or jaggery. You can also take bath with copper patra. Mercury: Mercury directly relates with skin and body odor. Skin, speech and odor problem occurs due to Mercury. To improve Mercury keeps gorochan, saunf or nutmeg in bathing water. Jupiter: Jupiter relates with digestive system, obesity and serious diseases. Hepatitis, obesity and cancer problem occurs due to Jupiter. To improve Jupiter keeps turmeric, saffron or honey in bathing water. It is also beneficial to take bath with bras utensils. Venus: Venus relate with chemicals and hormones of the body. Eyes, hormones, diabetes and sometimes blood problem occur due to Venus. To strengthen Venus keeps elaichi, rose water or white flower in bathing water. It is also beneficial to take bath with glass utensils. Shani: Shani relates with nerve fibers and long term diseases. Nerve fibers, fatal accident and disability due to Shani. To improve Shani keep black sesame, surma or loban in bathing water. It is also beneficial to take bath with water, keeping in iron bucket. Rahu: Rahu relates with hidden and mysterious diseases. One cannot get the reason and remedy for disease. 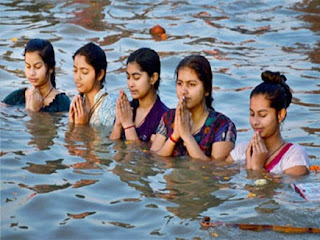 It is beneficial to keep gaumutra, kasturi or sangmarmar in bathing water. Ketu: Ketu relates with mysterious and incurable disease. Kidney, urine problem or skin problem occurs due to Ketu. It is beneficial to keep Kevada water, khas or sawet sandalwood in bathing water. Good Luck: It is beneficial to take start work, which finish fast. It is extremely beneficial to start journey and buy vehicle on this day.